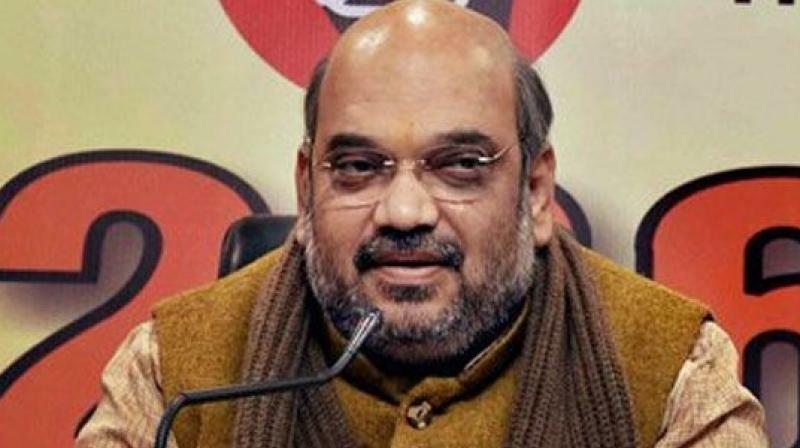 New Delhi: BJP President Amit Shah on Friday addressed party office-bearers in New Delhi ahead of two-day National Executive meet, where its top brass is expected to give final shape to BJP's poll strategy in assembly elections in five states. The party is seeking to make demonetisation, which it has terms as a "war against black money and corruption", a major poll issue, besides encashing on the surgical strikes in Pakistan-occupied-Kashmir and the "pro-poor" schemes. Shah finalised the party's resolutions to be passed in the two-day national executive meeting that will be inaugurated with his address later in the day. The BJP chief will seek to motivate the party leaders to steer the party to victory in five states that go to polls in February-March, especially in high-stakes Uttar Pradesh. The party leaders will discuss and review the ground situation in the poll-bound states, BJP leaders said. The party will use the occasion to burnish its pro-poor and pro-weaker sections credentials by citing several government schemes, including the recent sops announced by Prime Minister Narendra Modi. The top BJP brass is also expected to target the opposition over its attack on the government for advancing the Budget Session of Parliament and may project it as yet another attempt by the Congress and the other rival parties to derail Modi's "pro-poor" agenda. With the mood in the saffron camp optimistic following the prime minister's huge rally in Lucknow recently and what it believes to be a positive public response to the currency ban, the party is expected to project the opposition's criticism of the exercise as an attempt to protect the corrupt. Two resolutions, one political and the other economic, are likely to be passed at the meet. The army's surgical strikes last year to target terror launchpads across the border could also find a mention at the meeting. The Election Commission has announced the dates for Assembly polls in five states, Uttar Pradesh, Punjab, Manipur, Goa and Uttarakhand. BJP's central election committee is likely to announce the names of party candidates after the auspicious 'Makar Sankranti' which falls on January 14.